During the last weeks I worked on my new hotend which I called the organ pipe hotend. 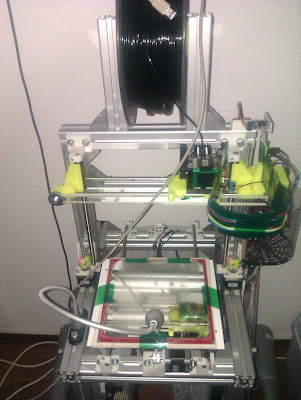 Actually I only wanted to reconstruct my repstrap, but then I broke up my hotend. As I didn't want to buy a new one, I decided to build one myself. The aim was to keep it cheap. As I do not have a lathe, it had to be simple. My first attempt was the Longsword Hotend, but I had difficulties with the PTFE liner. So I decided to omit the liner in favour of a stainless steel tube. That turned out to be a wise decision, as I soldered the nozzle and the tube together to what I call the pipe. All I have to do now is to build a second pipe. That's all. The BOM for a new pipe shows, how cheap this method is: 7cm stainless steel tube, 1 cm threaded brass rod. 1 M4 brass acorn nut. And a little bit of solder paste. Together less than 1€. This makes it affordable to try out a lot of different materials. And so are my plans on the long run. But first my new printer has to be completed. As my old repstrap was built of T-Slot aluminium profiles, I decided to adapt nophead's Mendel90 to fit onto T-Slot. So my "Mendel90T" was born. Unfortunatly I broke my hotend in the last days of my repstrap, when the nozzle went into the building plate, because the Z-endstop failed. At first glance, the hotend seemed to have survived, but afterwards it became clear that something must have gone wrong with it. So the completion of my Mendel90T had to be postponed until the hotend got ready.